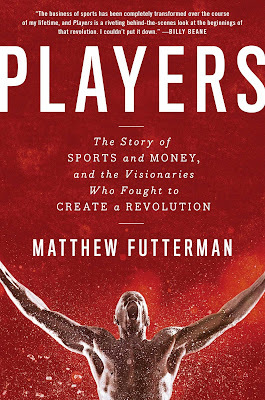 Brooklyn Digest: Books: Futterman Looks At Sports Business In "Players"
Players spends a lot of time focusing on the efforts of a lawyer from Cleveland names Mark McCormack, who came up with the idea of representing athletes for endorsement deals. McCormack went to the Carling Open in Atlanta in November 1958 to approach golfers about being represented by him for contracts on tournaments and endorsements. Futterman writes of McCormack's dealings with the golfers, "Confronted with actual contracts that empowered them with flexibility and the chance to make a few extra bucks, the golfers proved just as enthusiastic as they had said they were during the Carling Open. Some of them even seemed open to having McCormack and (Richard) Taylor represent them for all of their marketing efforts. To those who did, McCormack sent a Chinese menu of services he could provide in addition to exhibition work: everything from tax preparation to real estate advice. If an athlete allowed National Sports Management to represent him for product endorsements, even on a nonexclusive basis, they would pay a 12.5 percent commission on exhibitions and 15 percent for all product endorsements. "For a group of players who either didn't have anyone working on their behalf or were used to having equipment contracts put in front of their faces and told that the terms were nonnegotiable, McCormack's offers were a revelation. Under McCormack's contracts, the players had a say in what they would be paid, and they could ditch the whole thing after a year if they wanted to. The players merely had to agree to send all solicitations they received McCormack's way. He explained that this would spare them the awkwardness of saying no when friends asked for favors or discounted deals. The players agreed that any money they earned would get paid first to NSM, and then NSM would distribute the money to them. It would make it easier for McCormack to keep track of their payments for tax purposes, McCormack explained. He also insisted they send him copies of all the current deals they had with clubs, corporations, or equipment manufacturers. This would allow him to understand how and where he could boost their incomes. There was a side benefit in this for McCormack, of course; he was about to gain an overnight education in the market for the services of the best golfers in the world. Within weeks he was going to be the only one on the sell side of the business to know the going rate for Spalding's name on a golf bag or for Julius Boros to show up and play Merion with the executives of Philadelphia's top utility company." The golfer who McCormack wanted to represent the most was Arnold Palmer, who had won the 1958 Masters and was on a path to stardom. Futterman says of Palmer signing with McCormack, "The greenskeeper's son from Latrobe, Pennsylvania, who'd sneaked off with the 1958 Masters by a stroke, entered McCormack's stable on January 15, 1959. The concept of International Management Group, the industry behemoth that would eventually influence nearly every corner of the modern sports industry, still wasn't even a germ of an idea in McCormack's mind. But maybe, just maybe, this frustrating and fascinating game McCormack had started playing as a grade-schooler would start to pay him back in some small way. That was the dream." It took some convincing for Palmer, who played in front of the largest galleries known as "Arnie's Army," to sign up with McCormack. Futterman says of Palmer's thinking, "Palmer knew he could probably charge more for his time than anyone else on the tour. If McCormack was simultaneously representing him and a stable of less popular golfers, Palmer was bound to get undersold. 'I wanted someone to represent me alone,' Palmer says. 'I didn't want to be compared with and bargained for against two or three or ten other guys.' Despite his quoted prices of $750 for a weekday and $1,000 for a weekend or holiday exhibition, Palmer was only fetching $350 to $500. Worse, McCormack had only booked him for a few exhibitions all year. "With their partnership solidified, working for Palmer quickly became the central obsession of McCormack's professional life. Every other day he would call Palmer with another proposition. The phones didn't stop ringing. The offers kept rolling in. There seemed to be no limits to the empire that Palmer might be able to build. And then McCormack read Arnold Palmer's contract with the Wilson Sporting Goods Company of Chicago." That was the start of what would ultimately turn into Arnold Palmer Enterprises. The Wilson deal was the first of many big endorsements that Palmer did, from Hertz to AriZona, who sold his Arnold Palmer mix of iced tea and lemonade, to Xarelto, which aired the past few years. Palmer earned $875 million during his legendary career in golf, which also included designing golf courses around the world. Futterman also highlights legendary Wide World of Sports producer Roone Arledge, who realized that the way to win viewers was to blend sports and human drama; the 1973 Wimbledon boycott, where 81 of the top tennis players in the world protested the suspension of Nikola Pilic; and former Yankee pitcher Catfish Hunter's battle to become Major League Baseball's first free agent. This book is essential for any sports fan that likes the business side of the game.